I was visiting my favorite store, The Loft last week and was totally feeling their Scoopneck Tees and with the temperatures warming up this week I decided I had to find a pattern to pair with my white pant before falling prey to purchasing. 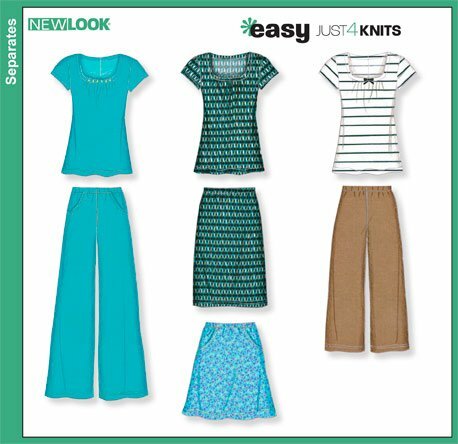 I used New Look 6875, Misses Knit Top, Skirts and Pants and sheer stretch printed knit. I'd purchased the fabric about a year ago initially intended to make a dress, but once I got home I wasn't sure the fabric would work for a dress and just added it to my accumulating fabric stash. I really like the simplicity of the top and its similarity to the top I looked at in The Loft and knew I would really enjoy not spending $44.5o for it. The top went together quickly and done in an evening (my favorite sewing projects). Looked at the instructions once and took off from there. I serged all the seams and always like the one piece neck binding. I'd cut a medium, but once I'd serged the shoulder and side seams and tried it on it was too big and removed about 5/8, since I was really looking for a more fitted top. The finished bust measurement for a medium is 39-1/2, which is 1/2" less than my measurements, but guessing the fabric dictated the excess ease. The sleeves were sewn in the round and could've been at least an 1" longer. For the hems, I serged the edges and fold to the wrong side and final stitched. Note to self, to remove a few inches from the neckline the next time around, there was some cleavage going on when I wore it, but it was all good. Final result, wore it and really like the fit and paired with my white pant was perfect for a causal Friday. really cute, the fabric makes that top. Love that fabric and the top! Love the color. Excellent job. Great top - I love the fabric! Good for you saving $45!! I love it when you can reproduce something from RTW cheaper and better than the original. 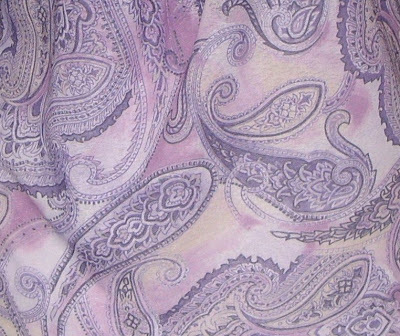 You always know how to pick out great fabrics! That top is sooo cute! I really love that top! I have been looking for something with a little "interest", not just a plain tee, and those gathers at the neckline are perfect! Thank You ladies. I'd plan to make another one this weekend, but was struck by the maxi-dress bug and currently working on that. Loving that purple fabric for that shirt. Great job on the shirt cute. So cute. Your things always look so speciall. Great looking top, well done!